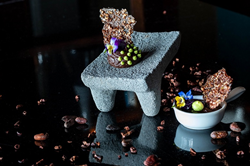 Grand Velas Los Cabos of Mexico’s Velas Resorts shares its recipe for Chocolate & Avocado Mousse, one of the dishes set to be served during the collection’s annual Sabor Cacao festival. Included in the nightly rate, the festival will be running simultaneously at Casa Velas and Velas Vallarta in Puerto Vallarta, and Grand Velas in Los Cabos, Riviera Maya and Riviera Nayarit. Blend ½ avocado, ½ lemon juice, coconut water and sugar in a blender. Transfer to bowl and stir in cacao powder. Set aside. Blend the remaining avocado and lime juice. Add salt and pepper to taste. Transfer to piping bag. Place the cacao mousse on a small plate, serve with the cracker on top and dress with the avocado puree from the piping bag. From April 1 – 21, Velas Resorts pays tribute to cacao, one of Mexico’s most traditional ancestral delights, with themed menus and cocktails to special resort activities, a Chocolate Mole Massage and an over-the-top Easter Brunch. Additionally, Master Chocolatier Jean Marie Auboine has designed 14 chocolate candies unique to Velas Resorts that will be served in the restaurants as an amenity at the end of the dinner. With more than 25 years of Chocolate and Pastry Industry experience, Master Chocolatier and Executive Pastry Chef Jean-Marie Auboine is a member of the illustrious Academie Culinaire de France and recognized among the top five chocolatiers in the world. The chocolates will also be offered in all the resorts’ boutiques in a special gift box. Velas Resorts in Riviera Maya, Puerto Vallarta, Riviera Nayarit and Los Cabos have earned 52 AAA Diamonds, including the prestigious Five Diamond Award. Other esteemed international awards for their services and facilities include Virtuoso’s “Best Spa,” Forbes’ “Coolest All-Inclusives,” Forbes’ Four Star Award, and TripAdvisor’s Hall of Fame, among others. Offering unparalleled all-inclusive experiences, properties include the AAA Five Diamond Grand Velas in Los Cabos, with dramatic ocean views and unique spaces infusing every area of the resort; AAA Five Diamond Grand Velas Riviera Nayarit, which enjoys a privileged natural setting with flowering, landscaped gardens beside a long stretch of pristine beach and a dramatic backdrop of the Sierra Madre mountains; and AAA Five Diamond Grand Velas Riviera Maya, located five minutes from Playa del Carmen, offering a sophisticated all-inclusive resort experience in the Caribbean with jungle and beach settings. In Puerto Vallarta, Casa Velas is a boutique adults-only hotel and ocean club located on the Marina Vallarta Golf Course, and Velas Vallarta, a family-friendly all suites resort and spa located on Banderas Bay. Mar del Cabo, a boutique hotel on Mexico’s Baja Peninsula, opened on December 5th as its only European Plan offering. Eduardo Vela Ruiz, founder and president of Velas Resorts, operates Velas Resorts with brother Juan Vela, vice president of Velas Resorts, by his side. For reservations or more information, call 1-888-407-4869, email reservations (at) velasresorts (dot) com or visit https://www.velasresorts.com.